Chennai: With anger sweeping Tamil Nadu over the Centre seeking more time to constitute the Cauvery Water Management Board (CMB), citing elections in neighbouring Karnataka, the ruling AIADMK has called for a hunger strike today. The Chief Minister of Tamil Nadu K. Palaniswami and his deputy O Pannerselvam have joined the day-long hunger strike today, protesting centre's stand on the Cauvery river water dispute. The arrival of the two top AIADMK leaders at the protest site in Chepauk, came as a surprise as the party had earlier said all AIADMK leaders will take part in the fast protest but not Mr Palaniswami and Mr Pannerselvam. "The hunger strike is to condemn the central government for not forming the CMB," the AIADMK said in a statement. AIADMK workers and supporters in all district headquarters of the state are also on hungerstrike, claimed the Tamil Nadu government. Over 21 lakh shops are reportedly shut in Tamil Nadu today. 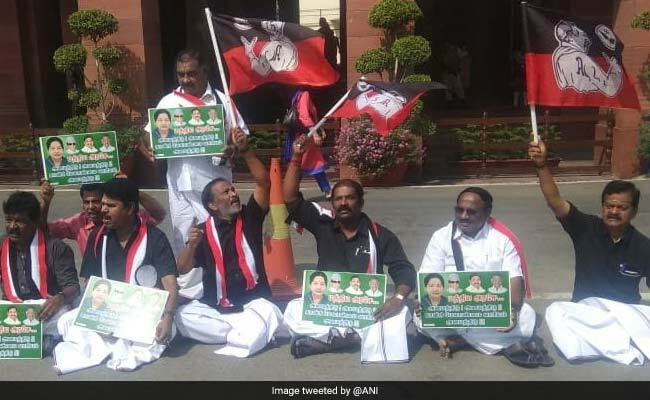 In Delhi, AIADMK Members of Parliament staged a protest outside Parliament. AIADMK MPs have been raising slogans in Parliament for the last two weeks. Rival DMK has demanded that Chief Minister Palaniswami convene a meeting of his cabinet and pass a resolution condemning the Centre and Prime Minister Narendra Modi over the Cauvery issue. A DMK Executive Council meeting condemned both the Central and state governments on the issue. Political parties in Tamil Nadu allege that the Centre did not set up the CMB as it does not want to alienate voters in Karnataka, which is opposed to the Supreme Court order. The Supreme Court on Monday said it will hear Tamil Nadu's contempt petition against the centre for not forming the Cauvery Water Management Board on April 9. The Tamil Nadu government had petitioned the top court for an early hearing as the centre has not implemented the top court's order on the Cauvery water dispute, though the deadline to set up the Cauvery Board has lapsed on March 29.